This picture shows a good friend of the artist and is a drawing exercise in how to capture a real life, immediate moment expressed in a instant facial expression, in this case a laughing smile. The friend is shown holding a lollipop stick, which is used as a severe, still line of intense light, and as a strong contrast in the picture. The artist also told me he wanted to highlight the fake white of the lollipop stick, placing it close to the natural colour of teeth. 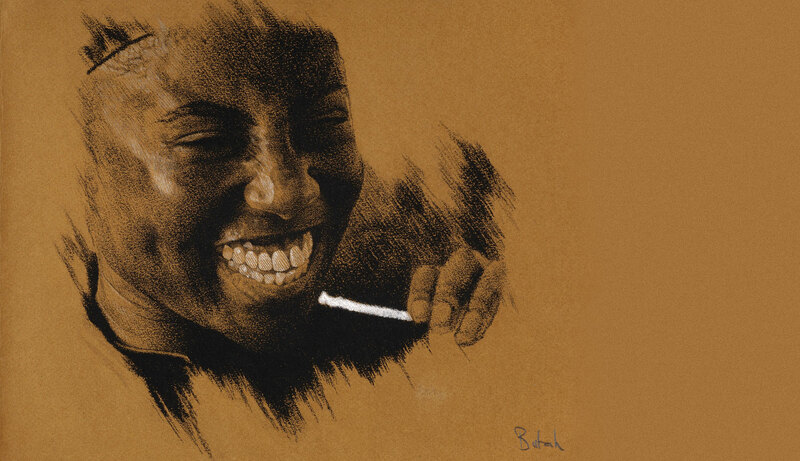 This is an infectious portrait study and I particularly like the way the artist has shown, or drawn, how a smile can completely transform the whole face in a split second. The drawing has some superbly observed and worked details, such as the stretched creases in the nose and the suggestion of the lollipop stick having been chewed.